Ballina /ˈbælᵻnə/ is a town in the Northern Rivers region of New South Wales, Australia, and the seat of the Ballina Shire local government area. Ballina's urban population at the 2011 census was 15,963. A larger area including Lennox Head had an estimated population of 25,194 at 30 June 2015. Ballina was established in the 1840s on the northern shore of the Richmond River near Cape Byron, Australia's most easterly point. It is approximately 600 km (373 mi) north of Sydney and 160 km (99 mi) south of Brisbane. Ballina is a coastal town and is connected to the Pacific Highway which passes nearby. The Richmond River was an important transport route for the region for the first 100 years after settlement. The river and its estuaries abound with marine wildlife and provide for recreational fishing and water sports. In 1973, the Las Balsas rafts were towed into Ballina by fishing trawlers after their journey from Ecuador. One of the rafts is preserved in the Ballina Maritime Museum. They had planned to arrive in Mooloolaba in Queensland, but currents forced them off their course. Their journey was almost twice as long as the Kon-Tiki expeditions of 1947 and proved that people could have travelled across the Pacific in ancient times. A branch railway line connected Ballina with the Murwillumbah railway line railway at Booyong. The line was opened on 24 August 1930 and closed on 12 January 1949. Ballina's etymology is not entirely certain. Some believe it was named directly after the Irish town of Ballina. A recent theory has emerged, without historical evidence, that a more likely source is a Bundjalung word, "bullinah", meaning "place of many oysters". This theory argues that the Aboriginal name reminded the predominantly Irish settlers of "Ballina", so the name's origin could be an accidental or deliberate corruption of the Aboriginal form. The population of Ballina township was 15,963 at the 2011 census (representing 38 percent of the Ballina Shire population of 41,828). The urban area had a population of 25,194, which includes Lennox Head and other suburban areas. There are five high schools in the town (Ballina High School, Emmanuel Anglican College, Richmond Christian College, Southern Cross School and Xavier Catholic College), six primary schools (Ballina Public School, Emmanuel Anglican College, Holy Family Catholic Primary School, Richmond Christian College, St. Francis Xavier Primary School and Southern Cross School), a hospital and aged care facilities. The Big Prawn, prior the destruction of the building supporting it. Ballina is home to the world's largest prawn (made of concrete and fibreglass). 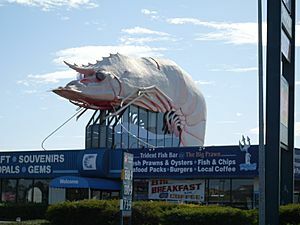 On 24 September 2009, Ballina Shire Council voted to allow the demolition of the Big Prawn, but this permission was never acted upon. Bunnings Warehouse purchased the site and refurbished the Prawn as part of the redevelopment. 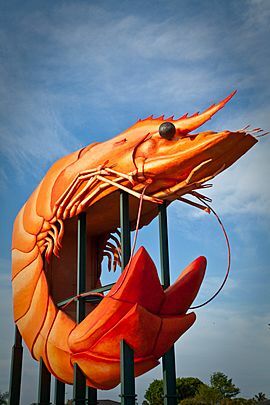 The prawn now sits on a stand next to the entrance of the Bunnings Warehouse carpark. The town of Ballina experiences a humid subtropical climate (Koppen Cfa), typical of the central part of Australia's eastern coast. Summers are sultry, humid and rainy, with approximately 40% of the town's total annual precipitation occurring from December to March, with March being the wettest month of the year, receiving an average of 215.6 mm (8.488 in) of precipitation. Ballina's annual precipitation total observes a considerably higher concentration in the first half of the year (January–June) than the second half of the year (July–December). Ballina's wetness is due to the town's coastal location and proximity to Cape Byron, the easternmost point in Australia, which means that exposure to moisture-laden frontal systems that develop throughout the year in the Tasman Sea follows accordingly. Ballina experiences a copious 1,817.9 mm (71.6 in) of precipitation annually, which is one of the highest annual precipitation levels to be found along the eastern coast of Australia south of the tropical coast of northern Queensland. The all-time highest and lowest temperatures ever recorded in the town are 42 °C (107.6 °F) and −2.0 °C (28.4 °F) on the 12 January 2002 and the 17 June 1999 respectively. The long-awaited Ballina bypass project upgraded 12.4 km of dual carriageway road, extending from south of Ballina at the intersection of the Bruxner and Pacific Highways to north of Ballina at the intersection with Ross Lane at Tintenbar. Twelve kilometres of local roads were also upgraded. Early works started in April 2008 and substantial works on 16 June 2008. The Cumbalum to Ross Lane section opened in 2011 (the bypass was extended an extra .5 km to allow for a better connection to the Tintenbar to Ewingsdale Project) with full completion in mid-2012. The project had its final traffic switch opened to public in April allowing for separation of the Pacific Highway and the Bruxner Highway traffic. The major airport for the region, servicing Byron Bay and Lismore, is in Ballina. The airport has links to Newcastle, Melbourne and Sydney with Jetstar Airways, Regional Express Airlines and Virgin Australia each operating services. Ballina Airport is located in Southern Cross Drive and is 5 km (3 mi) from the Ballina CBD. The airport is a 30-minute road trip to Byron Bay and 40 minutes to Lismore. In 2005 the Ballina airport was renamed the Ballina Byron Gateway airport in a bid to attract more people to the area. Ballina, New South Wales Facts for Kids. Kiddle Encyclopedia.